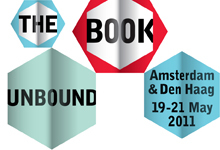 The Unbound Book Conference Report functions both as a summary and as archive of the project of the Unbound Book, held in Amsterdam May, 2011. It consists of the key results, the conference program, all conference blogposts and many other (research) blogposts concerning the topic of e-publishing. The conventional notion of the book, based on centuries of print, is becoming rapidly outdated. Meanwhile the capacity to create digital book-like functions and forms is endless. In a double sense, the book is unbound, both from the bindings of the printed volume, but also the boundaries between types of content (pictures, video, animations, and games) and modes of authorship in a wide, interconnected electronic space. Through panel discussions, presentations, and workshops, the Unbound Book Conference brought together academics, designers, writers, librarians, software and hardware developers, and publishers who wanted to take part in defining their roles within this transformative landscape. The Unbound Book: Reading and Publishing in the Digital Age, was held 19 – 21 May 2011 in the Hogeschool van Amsterdam (19 May), Koninklijke Bibliotheek (20 May), and Openbare Bibliotheek (21 May).